Teacher Librarians, from left, Sue Inhelder (MHS), Erin Faas (Rogers) and Beth Steffa (Anson) were recognized by the board for receiving Outstanding School Library Program awards from the Iowa Association of School Librarians. 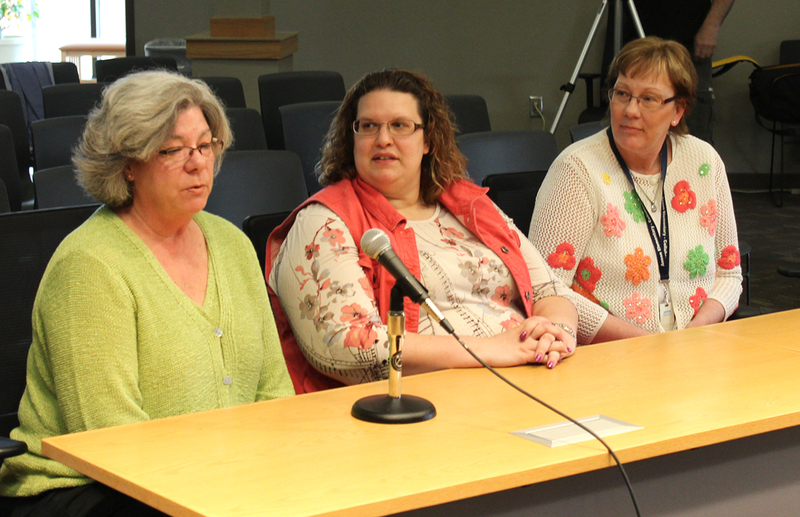 Three teacher librarians in the district were recognized by the school board for receiving Outstanding School Library Program awards from the Iowa Association of School Librarians. The librarians included Sue Inhelder of MHS, Erin Faas of Rogers and Beth Steffa of Anson. Dr. Marvin Wade gave an update on the Strategic Action Plan. He said there are legitimate reasons to extend the plan another year, which will be through the 2015-16 school year. The two main reasons include: 2015-2016 is the last year of Iowa Assessments and all nine measures of the Department of Education’s School/District Rankings will go into effect during fall of 2016 (both will have significant influence on the Strategic Action Plan). This was an information item only at the meeting and not up for board approval. For additional details on the plan, click here. Transportation Director Don Meyer presented bus bids to the board, which were approved as part of the bus replacement schedule. The district purchased two 77-passenger buses and one 36-passenger bus from Hoglund Bus Company for $243,968 and one 84-passenger bus from School Bus Sales for $91,510. The total amount for all four buses is $335,478, which will be paid for by Physical Plant and Equipment Levy (PPEL) funds. 905.2 – Parent Teacher Organization Building Use – No changes, marked reviewed. Marshalltown High School students Chandler Fisher and Megan Emerson perform their award-winning duo interpretation piece to the board on April 6. The pair will compete at the national speech and debate contest in Dallas, Texas in June. 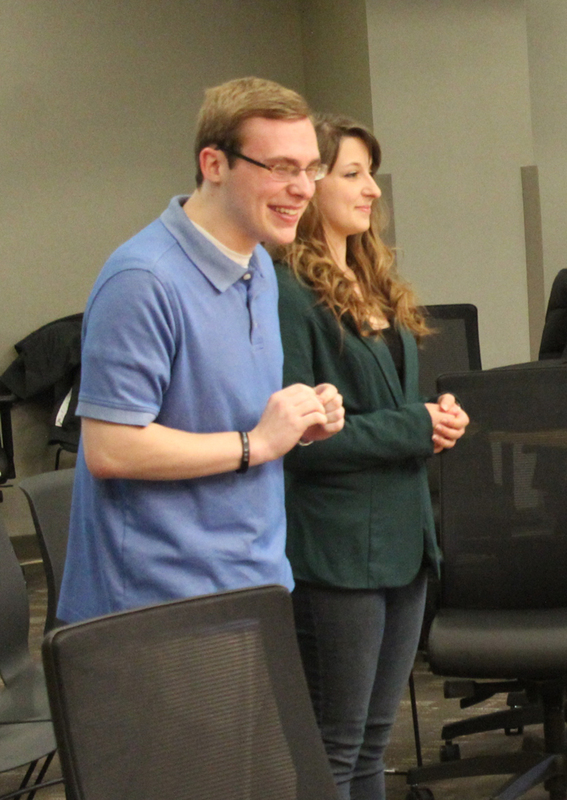 Marshalltown High School students Chandler Fisher and Megan Emerson performed their award-winning duo interpretation performance that they will take to Dallas, Texas for the National Speech and Debate Tournament in June. It received big applause from the board and those in the crowd. For video of the performance taken by McTV, click here. Jacque Wyant was approved as the next principal of Marshalltown High School and will start July 1. Click here for other personnel items approved during the meeting. Jason Doonan from Nolte, Cornman & Johnson delivered the audit. General fund revenues increased by $2.6 million to $57.82 million in fiscal year 2014. General fund expenditures increased $1.28 million to $57.17 million. Hoglan Principal Amy Williams and school leadership team members Deb Moore, Lisa Frauenholtz and Lora Kester provided the yearly attendance center plan of the school. The elementary school has an enrollment of 381 students, with 45 percent of those being English Language Learners. The group covered a wide range of topics including Sheltered Instruction Observation Protocol (SIOP), Language Literacy Framework, Common Unit Design, Multi-Tiered Systems of Support, Positive Behavior Intervention and Supports (PBIS), student recognitions and parental involvement. Dr. Marvin Wade spoke on the Continuous Learning Calendar Committee, which will start the process at looking at options to recommend to the board in the future. The committee includes Aimee Deimerly, Bianca Greazel, Blanco Guidino, Gretchen Hageman, Karina Hernandez, Lisa Neuan, Victor Cisneros, Amy Pieper, Arlene McAtee, David Barajas, Jenny Fisher, Karn Gregoire, Kelli Thurston, Kendall Shomo, Lynn Olberding, Randy Wetmore, Valerie King, Jacy Large, John Johnson, Ken Hayes, Kendall Derby, Lisa Koester, Mick Jurgensen, Susan Pecinovksy, Brad Weidenaar Sarah Wherry, Kate Troskey and Sue Cahill. The committee was approved by the board. Dr. Susan Pecinovsky presented the latest graduation and dropout rates for the district, and said both reflected good news. The graduation rate in 2014 was at 87.06 percent (4-year-cohort), which is the highest it’s been in the last three years. The dropout rate also reflected good news as it was down. Kevin Posekany said this gives the district authority to spend 1 percent more in the coming year in the case that State Supplemental Aid ends at zero percent. Posekany said if the state does approve aid increase this budget guarantee is not needed. The budget guarantee resolution was approved by the board. The board approved the 2015-16 district budget with a levy rate of $18.43, which reflects a 28-cent increase. When the state takes action on State Supplemental Aid, the tax asking is expected to come down, and likely will be on track with the current levy rate of $18.15, Posekany said. A public hearing was held for plans, scope of work, schedule and anticipated budget For the MHS administration additions as well as security/vestibule upgrades at at Hoglan, Franklin, Woodbury and Marshalltown Learning Academy. Projected cost is $1 million for MHS west addition and additional $740,000 worth of alternate work. The board approved the plans, scope of work, schedule and anticipated budget and the public bid process will now proceed. Bids are to be received on May 14 with possible bid award at the May 18 board meeting. An asbestos abatement bid for 317 Columbus Drive (old Central Office building) was approved as the district prepares for the building to be demolished. The low bid from REW Services Corporation of Ankeny of $99,548 was approved. 904.4 – Money Raising Activities in the Schools – Approved as amended, waive second reading. 905.1 – Community Use of School Facilities– This policy will be amended with updates to facilities. Included in working with this policy will be staff associated with athletics, fine arts and other groups of people. The next regular board meeting will be April 20. Passing a budget for the 2015-16 school year was especially painful for me tonight because it had to be done, and we are still in the dark as to how much (if any) supplemental state aid we will receive. It appears that our legislators (and the governor) have forgotten that public schools are not income-producing entities; we have to rely on government to fund our efforts. So, we (the school district) have to build a budget for a multi-million dollar institution based on assumptions and hopes resting squarely on the property tax-payers of the district. Please be assured that we are being very conservative as we plan the spending or OUR (yours…and mine, too!) resources. – Kay Beach.